The Aurora Borealis dances high above your head. Incredible jagged mountains tower out of the ocean. Endless seascape compositions are everywhere you look. 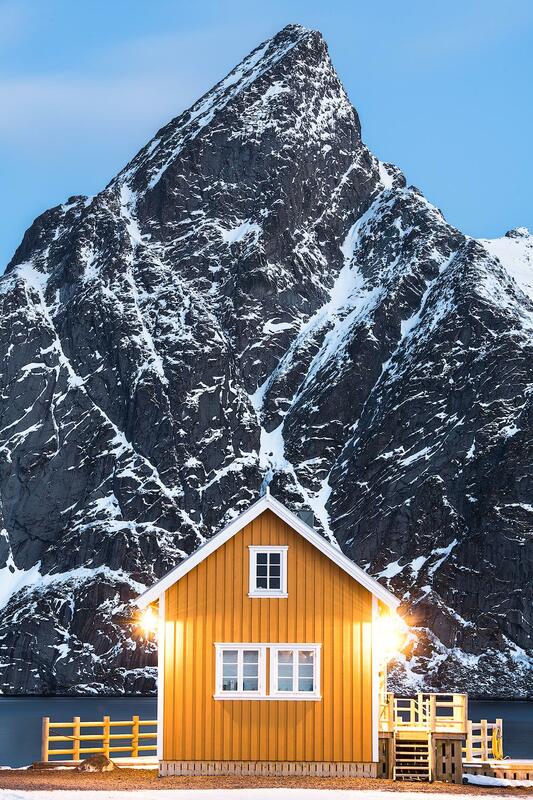 Norwegian towns pop out of the snow with vibrant colors. Have I got your attention yet? If not, I can keep going. Come along for the ride as we photograph some of the best locations the Lofoten Islands hav to offer! This place is practically a real life Narnia. Although the journey to get there isn’t short, I can promise you that once you arrive, you will never want to leave! During this workshop we will be out and about from sunrise to sunset creating amazing imagery. Oh don’t worry, after dinner we will head out in search of the phenomenal northern lights! How to create compelling winter landscape compositions. How to photograph the aurora borealis. How to create motion blur in seascapes. How to be patient and wait for the crazy Norwegian weather to give you an amazing opportunity to shoot! A DSLR camera body and assortment of lenses. A wide angle is highly recommended as well as a zoom lens. - An intervalometer (a cheap one off of Amazon will work just fine). - A headlamp or flashlight. - At least the trial version of Lightroom or Photoshop on your laptop. - A 10 or 6 stop neutral density filter for your wide angle lens. - Microspikes for your boots. - An up-to-date passport. - A desire to learn, have fun, be flexible, and explore nature! Lodging. We will have two awesome cabins at each location. Bedrooms and washrooms will be shared. My photography knowledge, 24 hours a day during the entire workshop. Post production videos that will be sent out after the workshop. We will be lodging at some amazing cabins right along the coastline with stunning views of Norway! Some days you will literally wake up, put your boots on, and step outside for our sunrise shoot! Rooms are shared and our common space will be where we enjoy our breaks and edit. We may possibly be doing some short hikes (up to 1 mile one way) with moderate elevation gains on one or two outings. We will take any hikes at a slow and enjoyable pace. Please know your limitations. If you feel that you may not be suitable for a hike, I will gladly give you an alternate location to shoot while the group heads out. You will want to fly into the Leknes airport on the Lofoten Islands. This usually requires a stop a flight from Oslo, Norway to Bodo, Norway...then a short commute to Leknes. Our workshop will begin on March 17 at 1pm. I suggest flying into Leknes the prior day and stay the night in Leknes to allow for some wiggle room in case of flight delays. To get to our workshop starting location, I would recommend taking a taxi as our first cabin is about 15 minutes from the airport. When does the workshop start and wrap? The workshop will begin with our meet and greet at 1PM on the 17th and wrap at 9am on the 23rd. It is highly recommended to fly in a day prior to avoid any possible travel delays and to adjust to the time change.